Wood Products Corporation's experienced staff can assist you with new product pallet design as well as consultation on redesigns to create a more affordable or effective packaging solution for your company. 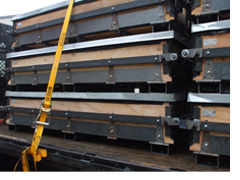 Solutions may be as simple as a redesign of an existing pallet or crate by adding boards or better quality fasteners. Manmade substrates such as CDX, OSB, MDF or laminated beams can be added to strengthen stress points and increase overall integrity of the wood packaging product. Sometimes a complete design overhaul is needed to prevent product damage. We can incorporate PE Foams, felt, or corrugated panels to protect finished products or add non-scratch foam to protect finished parts and prevent static charges. Proper sizing of wood packaging can also be an issue. We offer CNC processing with tolerances of .004 inches which guarantees sizing and hole placements will be accurate. 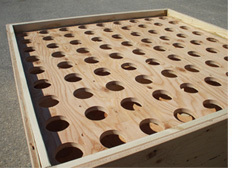 For details, visit our CNC Routed Parts and Panels page or call for more information.